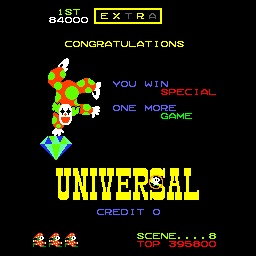 You control the clown Mr Do! in his mission to eat all the cherries and kill all the monsters. 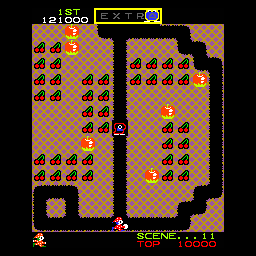 You are pursued around a maze by monsters, and you can tunnel through the maze area to eat the cherries. You can kill the pursuing monsters in two ways; either by throwing your snowball at them (which recharges periodically) or by dropping or pushing apples onto them. Once all the monsters leave their base in the centre of the maze, a special bonus item appears which when eaten causes the letter monster and three alpha monsters to emerge from inside the EXTRA letters at the top of the maze. While these are out the other monsters in the maze are frozen, and killing the letter monster rewards you with the appropriate letter towards an extra life. 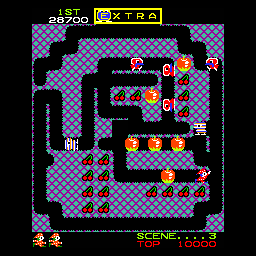 Each level can be cleared in several ways. either by killing all the monsters, eating all the cherries, by a monster eating the last cherry, by collecting an extra life or collecting a free credit. Letter monsters also appear on their own every 5,000 points, and these do not freeze the other monsters. They simply wander around the maze, eating the apples and will kill you on contact. There is also a diamond hidden in an apple which appears completely at random when an apple falls more than two squares. This can occur on any screen. Collecting this awards you a free credit and 8,000 points. 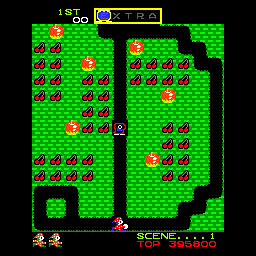 Each screens layout spells the last digit of the level in open space (from stage 1 to 0 marking each tenth stage) and the position of apples is random. You can hide behind the apples and push them out to fall onto the pursuing monsters, and points are awarded for the number of monsters you kill per apple. In later levels all monsters move faster while your speed does not increase, thereby making the game progressively more difficult. 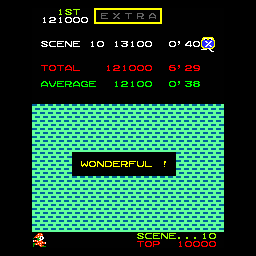 After every third level an intermission screen appears showing you your points breakdown and time taken on each of the preceding three levels, and the way in which each level was cleared. After every tenth level you get a similar intermission, showing the breakdown of your total time played and average time and score per level. Scoring: Eating a cherry: 50 points. Eating a series of 8 cherries in a row: 500 points bonus. Killing a monster with your snowball: 500 points. Killing one monster with one apple: 1,000 points. Killing two monsters with one apple: 2,000 points. Killing three monsters with one apple: 4,000 points. Killing four monsters with one apple: 6,000 points. 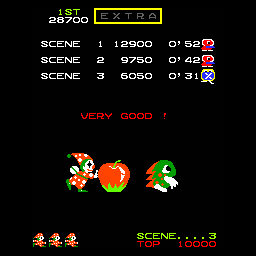 Killing five or more monsters with one apple: 8,000 points. Colecting special (free credit) diamond: 8,000 points. Collecting bonus treat from empty monster home: 500 points on level one, increasing by 500 points per level up to a maximum of 8,000 points on level 15 onwards. Yankee Do! (Hacked Version) - With an American Civil War theme, apples are replaced by oil barrels, and you control Uncle Sam with a bomb instead of a clown with a snowball. You run faster digging through the dirt than through open terrain, and the Letter monsters are always unaccompanied, and only freeze your enemies for a few seconds. This is the hardest of the Mr. Do! clones. Game difficulty can be set to Easy, Medium, Hard or Hardest (default is easy). Special (diamond) can be set to easy or hard (default is easy). Extra life can be set to easy or hard (default is easy). Starting lives can be set to 2, 3, 4 or 5 (default is 3). The extra letters appear every 5,000 points. Check which letter is lit before you pass the 5,000 point barrier releasing the letter monster. You can then be selective and only release the letters you require. The letters light cycling from left to right, and back to the left, pausing longest on the 'E' and 'A'. On the early levels the letter and alpha monsters should not pose a threat as you can outrun them. This is not possible on later levels where they move much faster than you. Dig up to the left or right of an apple then immediately below and past it. The apple will then fall behind you and you should turn and push it back so it is overhanging the vertical tunnel. Wait for the monsters to queue up under the apple (since they cannot get past it), and then push it over the edge to drop it and kill them all. If you wait too long one of the monsters will turn into a digger and cause the apple to fall down. Monsters turn into diggers much faster on later levels. If you are being pursued by a monster dig through unclaimed earth in a straight line. The monster will usually pause to turn into a digger, giving you enough time to turn and kill it with your snowball. If you are being closely pursued by a monster do not turn a corner as you will be caught. Alpha monsters always run directly towards you, and if you are being closely pursued you should continually run through an already dug area and you will not be caught. Fire your snowball and hope it rebounds round the maze to hit the pursuing Alpha monster. Each screen layout is based on squares and if you drop an apple between two squares Letter Monsters cannot eat them. If you wait above an apple positioned halfway between two squares, all the monsters will wait below it until the dirt underneath is eaten by a monster. The apple will then fall killing every monster on the way down. If you are killed and the last remaining monster is killed after you die by a falling apple, you will be resurrected and advance to the next level. On the later stages where the monsters are moving much faster than you, your primary aim should be to reach the upper half of the screen as soon as possible. All monsters will then make a beeline for you and you can wait above an apple so it will be dropped when diggers clear the dirt underneath it. Using this method you will wipe out several of the monsters making it easier to grab the treat in the centre when it becomes available. Try to get one or two lone letter monsters per level as well as the one when you collect the treat. You should be able to rack up an extra life every three or four levels or even better. If your reflexes are fast enough you can quickly reverse, fire a snowball and turn again to kill a closely pursuing monster. When you collect the treat in the centre of the maze on later levels, use your snowball to kill all frozen monsters except one. 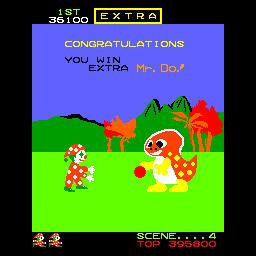 When you then kill the letter monster you will have less to worry about to clear the level. Turn a cherry into a rose! Move half-way over a cherry, but not far enough to eat it. Do this on all 4 sides of it, and it will become a rose! Useless, but it's still a neat easter egg!